To some extent, priesthood leaves an indelible mark on one’s journey of consecrated life. It is usually thought that priesthood is a divine grace unlike any other vocation open to men. Anyway, the grace of priesthood is not only an unconditional gift but also a mission for the chosen one to undertake with faithfulness. With his ministerial priesthood, a Jesuit priest should be available to serve and to continue building God’s people. 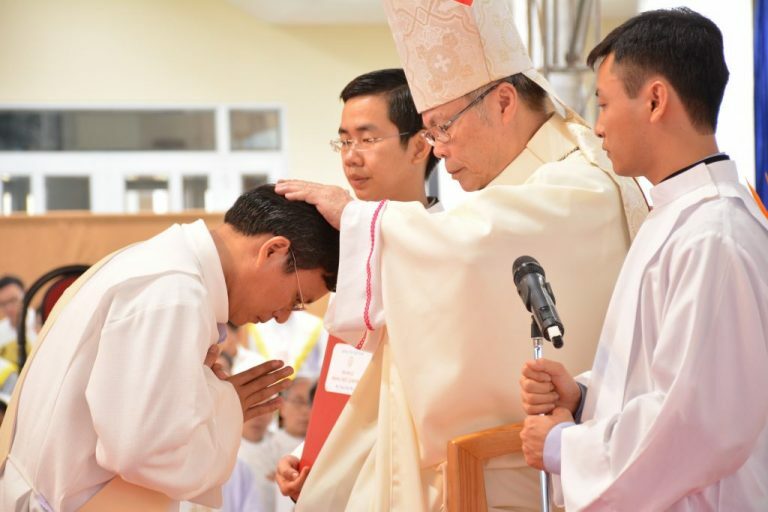 For the greater glory of God and for the sake of others, he the new ordained priest is asked to be ready for being sent to everywhere during his life of mission. 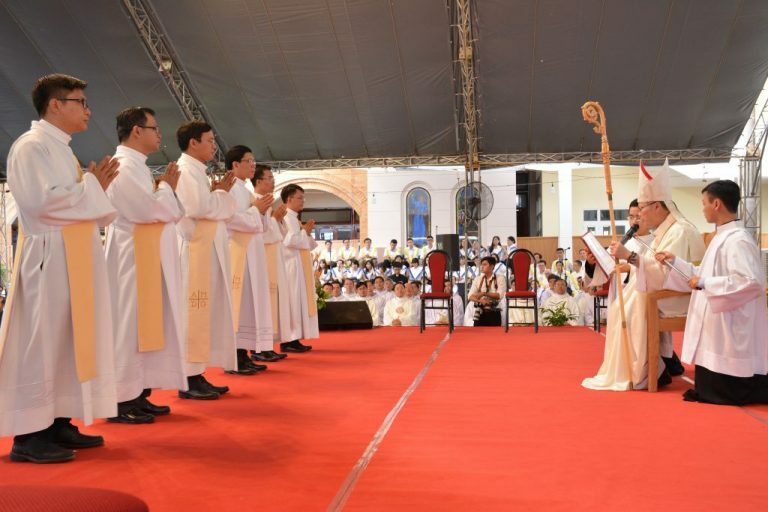 His Excellency, Archbishop Joseph Nguyễn Chí Linh, the President of the Catholic Bishops’ Conference of Vietnam as well as the Archbishop of Hue Archdiocese, was the presider of this Priestly Ordination. The concelebrants were Very. Rev. 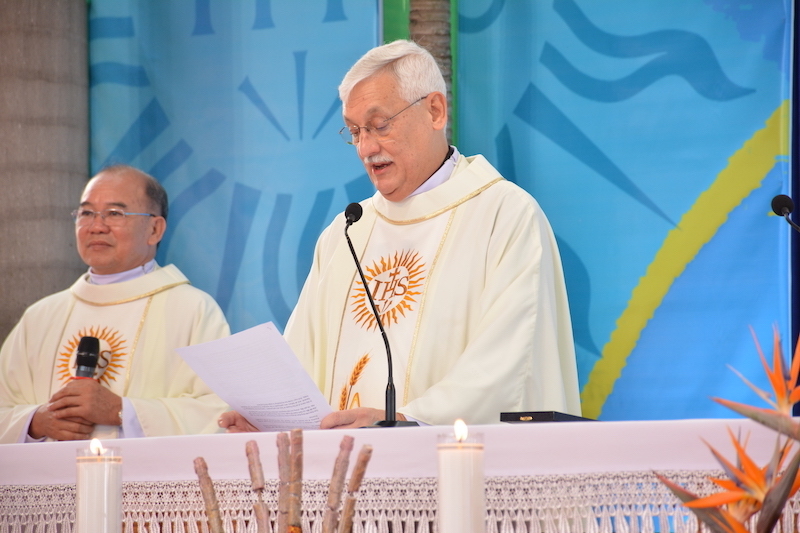 Fr Arturo Sosa – the Superior General of the Society of Jesus – and his Assistants, Rev. Fr. 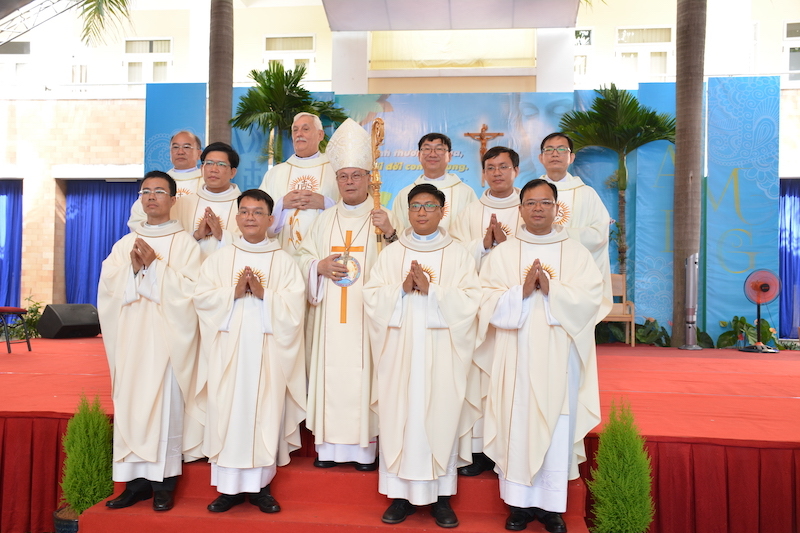 Vincent Phạm Văn Mầm – the Superior Provincial of Vietnam Jesuit Province, and approximately 110 priests inside and outside the Society. First, the Archbishop underlined God’s loving call as an unconditional grace for those who are chosen to be a priest. Actually there are no sort of worldly standards for the election of priesthood (i.e. talents, good profiles, good look, etc); but to tell the truth, these standards, of course, depend on the creative love of God. Therefore, the new ordained priests are expected to be able to serve God and others with agape – the divine love. That type of supernatural love only comes from a constant and close relationship with God. Second, the Archbishop recommended the soon-to-be priests to be aware of the role of witnesses of love and sharing which may help to bring about somewhat positive changes of this world. To do this, the priests have to contemplate their High Priest Jesus on the cross in order to draw from His sacrificing mystery the source of spiritual power for their Jesuit life and pastoral mission. Up to now, a lot of Jesuit Saints and Blessed seen as witnesses under the Holy Cross and collaborator of Jesus’ salvation have been being good examples to their descendants of denying worldly vain invitations and temptations. After the meaningful and inspirational homily, the main Rites of Ordination to Priesthood got started. The Rites in particular and the Order of Mass in general were accompanied by the harmonically devotional hymn songs operated by a choir of over 100 members Jesuit and non-Jesuit including cantors, singers and music players. Those melodies and lyrics, especially the Ignatian Suscipe, echoed in participants’ minds and hearts. After the Communion, Fr. 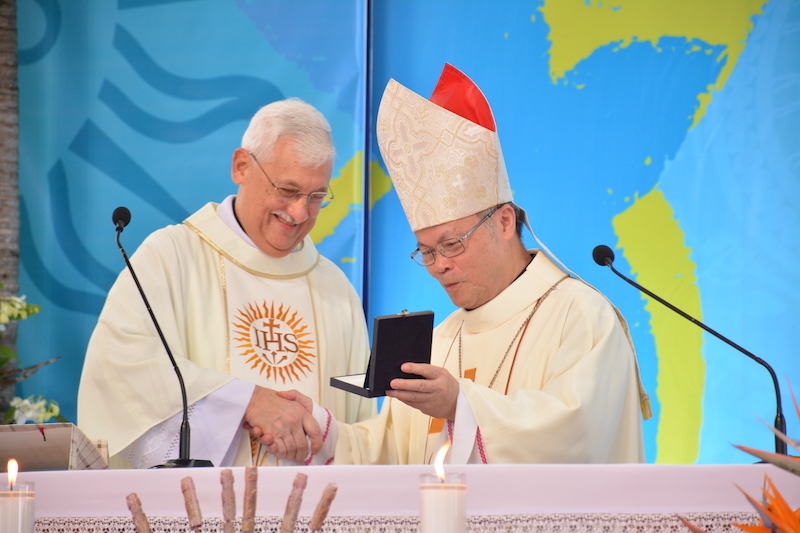 Provincial of the Society of Jesus in Vietnam gave special thanks to the Archbishop Joseph for braving the distance to cordially come and celebrate the Mass. Thanks were to Fr. General for his warm presence and heartful partaking. In response to the thanksgiving from Fr. 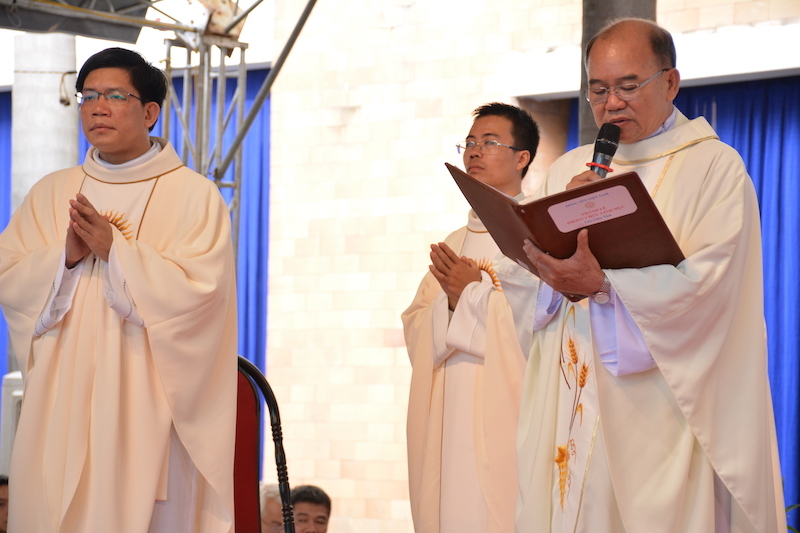 Provincial, the Archbishop did express his own love and appreciation to the Society of Jesus in Vietnam. One way or another he recalled Jesuit great contribution to the Church in Vietnam. 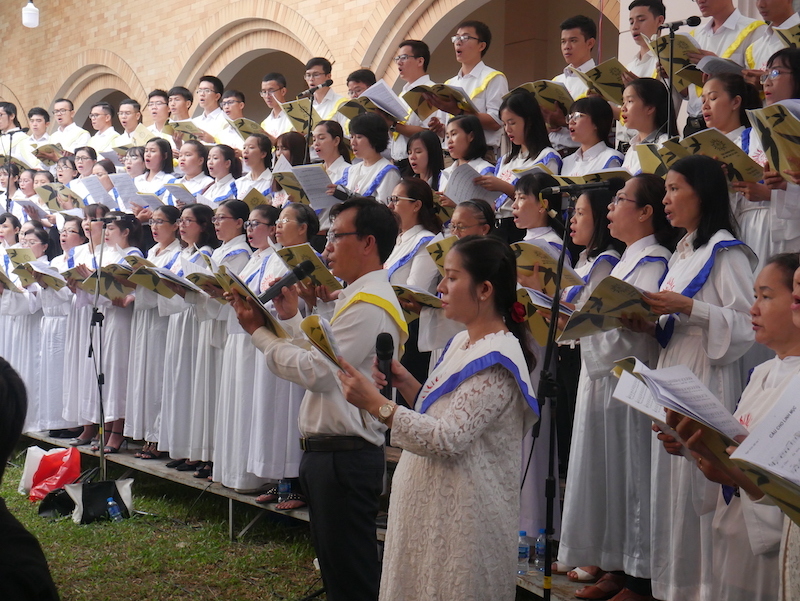 To cite some single facts as examples, the Jesuit ministries have been contributing enormously to the Evangelization in Vietnam; to the formation of priests, seminaries and a lot of religious man or woman; to spiritual companionship programs; to pastoral cares in catholic groups and universities, etc. Besides, the Archbishop was grateful for the Jesuit contribution to Vietnam society, particularly in cultural and intellectual aspect. Actually no one can ignore the unforgettable Alexandre de Rhodes’ credit for his somehow contributing to the creation of Vietnamese script. At last, he gave a somewhat witty suggestion that if only Fr. Superior General had accepted the establishment of a sort of “female Jesuits”, then there would have been uncountably members in the Society. Next to the Archbishop’s saying and in response to his kindness, Fr. General sincerely gave to the Archbishop a small gift as a token of the first time they meet one another. With all of his grateful attitude, Fr. General asked the Archbishop again to continue loving and supporting the Vietnamese Jesuits in their vocation and their serving and evangelizing mission in Vietnam. At the end of the ordination, Fr. General had a message to all the participants. He also congratulated and gave thanks to the families of six new priests, especially the parents for forming their “son-priests” well and for generously sharing their sons with the Society and the Church. Thanks were to all present then – friends, fellow religious, diocesan clergy, and brother Jesuits – of the new priests. Fr. General asked all to continue to support the new priests with their daily prayers. In saying a brief word particular to the new priests, Fr. 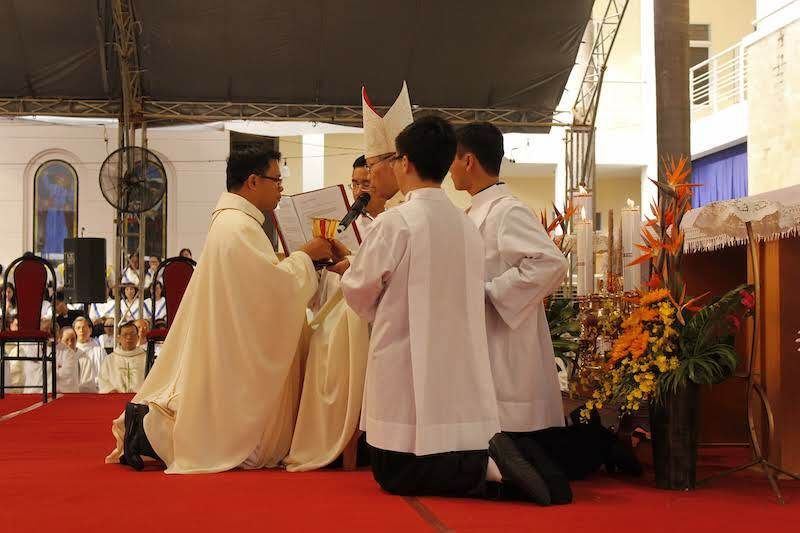 General reminded that priesthood is an unconditional gift from God, not for the own sake of the new priests, but so that they can serve God’s people, within the Church according to the charism and way of proceeding of the Society of Jesus. In linking to the feast of St. Francis Xavier, Fr. General wished to pray that the new priests would always follow St. Francis Xavier’s noble examples: free to be sent to mission; going to the frontiers with creativity; and always happy to share his life-mission, to be part of a team with his brothers and other companions in the one mission of Christ. After the Mass, everybody had a breakfast of brotherhood in order to share their joy as their beloved receive the gift of priestly ordination in the Society of Jesus.